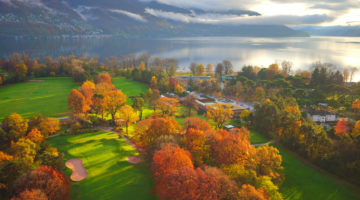 This 18-hole course, set above Lake Maggiore, is just 10 minutes away from the Italian-speaking southern Swiss City of Lugano. 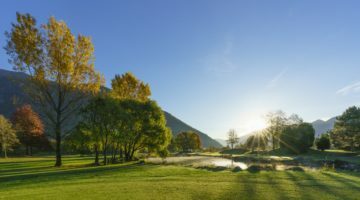 As the Magliasina River wends its way towards Lake Lugano, players find that a round of golf from beginning to end requires them to play over the river no less than eight times! Although tranquillity and soft green colours emphasise the recreational qualities of this course, there’s no lack of sport here in Lugano. Technique is crucial, not least because of the course’s narrow fairways and numerous water hazards. In addition, the greens themselves are well defended by natural and artificial obstacles. Come and be charmed and excited in equal measure at this varied course in the middle of the Ticino river landscape and enjoy golf at its finest. Players with Handicap 36 or less and a current club card of a recognized golf club (ASG / ASGI / GolfCard Migros) are welcome. Guests are also allowed on weekends. Members of ASGI or GolfCard Migros have to show a Handicap 32.0 or less.